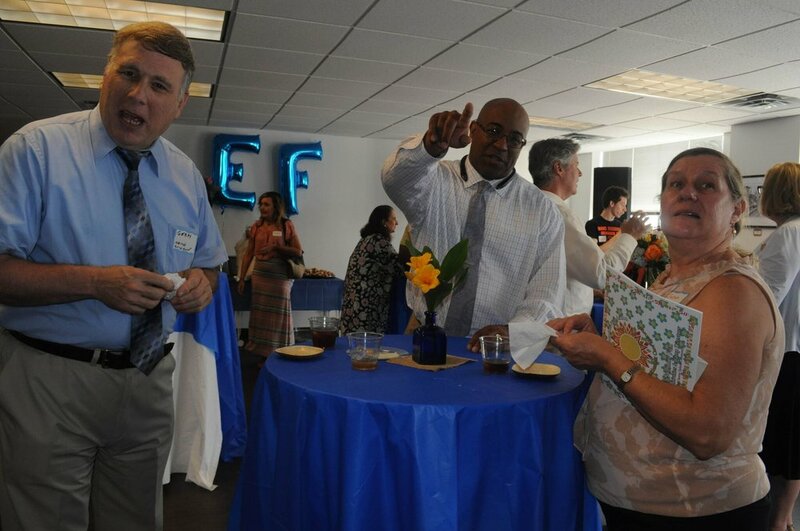 CEF Open House a Success! Literacy Access Fund, a 501(c)(3), public charity, announces its first grant award of $10,000 to the J.
Lewis Crozer Library in Chester, Pennsylvania. Literacy Access Fund secures funding from corporate, foundation, and individual partners in order to provide financial support to underfunded public libraries through a competitive granting process. The goal of the organization is to help libraries provide equal access to quality resources for young learners, regardless of economic factors. For more information about Literacy Access Fund, visit http://www.literacyaccessfund.org/ or call 610-833-6411. The Chester Education Foundation would like to welcome the new addition to our board, Jayme Gortman. Gortman was officially welcomed on October 23rd. Gortman received her Bachelor of Arts in Sociology at Goucher College and went on to complete her Masters at Widener University, studying Public Administration. She has 14 years of experience in grants management, and strives to improve the health and economic outcomes for underserved populations. Chester is a delicate community with many needs in regard to economic development and education, which is why the employees at CEF work so tirelessly to improve all aspects of life for the city residents. Jayme’s experience and connection to the local community will make her an asset to the CEF team because she has direct experiences with the precise issues in the area. 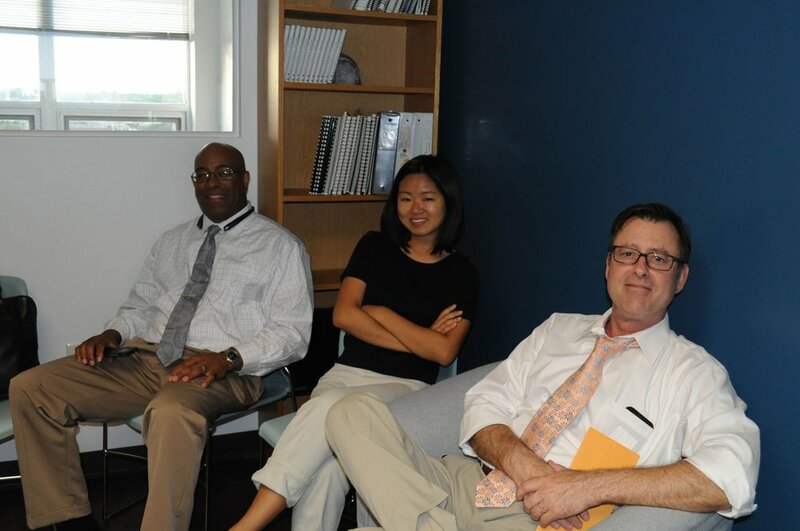 One of the Chester Education Foundation’s greatest resources is its staff full of people who have firsthand knowledge of the community and its needs, allowing CEF to ensure that any improvements being made or programs being offered are both relevant and necessary to Chester’s specific needs. Jayme’s dedication to improving the community and helping the youth of Chester will make her a perfect addition to the board. Jayme is quoted as saying, “Every kid is only ONE caring adult away from being a success story.” Her passion and caring nature will surely impact many children in the area as she begins her work at CEF. We are excited to have Jayme as a part of the CEF team and look forward to everything she brings to the table! Chester Education Foundation recently received a generous donation from an anonymous donor through the Silicon Valley Community Foundation. The donation was made in honor of a University of Pennsylvania student from Chester who died in 1989. The letter that accompanied the check requested that, if possible, we should let his mother "know that his friends think of him, and his great spirit, every day". I was unfamiliar with his story so I did a little research and came across an article published in the University of Pennsylvania paper about the sweet-hearted engineering freshman from Chester who did not return after Christmas break. In the words of the author, "Urban America is not exotic. And as much as we would like to believe otherwise, it is not another culture, another world. It is a part of who we are -- as a nation, as a society. The problems, the sorrows and the horrors which all too often come with the turf in our cities affect every single one of us". When I read the article, it made me cry because it could have been written this week. Little has changed in the City of Chester, or in most urban communities since 1992. On average, we lose 1 young person to street violence every month in Chester. While I was not with Chester Education Foundation when it was started in 1989, I am sure that the original founders were aware of the tragic loss of this young man that year and were determined to make a difference. Since then, we have helped more than 9,000 young people graduate from high school and go on to college or work. As we continue our work, one young person at a time, we are very grateful for the donation from the donor and promise that the funds dedicated to a friend’s memory will be used with the utmost respect and consideration. The Chester Education Foundation (CEF) would like to express our appreciation to Penn State Brandywine’s Information Technology staff for volunteering to update our computers last month. CEF’s offices and classrooms are outfitted with dozens of computers that were in need of a memory upgrade in order to continue functioning optimally. These upgrades would have cost our organization at least $1,500 in fees, all of which were avoided by the volunteer work of Penn State. In total, 36 computers were upgraded with additional memory to help keep our technology running smoothly to continue serving the Chester community. So thank you to Bill Tyson, Director of Marketing and Communications and Justin DiMatteo, C.J. Journey and Scott Schmoyer from the IT department and congratulations Penn State Brandywine on your 50th anniversary! Above are Penn State Brandywine IT department employees Justin DiMatteo, C.J. Journey and Scott Schmoyer alongside CEF Program Director Gerald Rocha. The Chester Education Foundation recently relocated to the Crozer Building at 419 Avenue of the States, in the heart of overtown Chester. The surrounding area is filled with some of the community’s best entrepreneurs and artists. To coincide with CEF’s move into the area, a tour was in order. On Friday October 6th, the staff of CEF and building neighbor Entrepreneur Works went on a tour of Avenue of the States. First, the group had breakfast at Brothers’ Restaurant and Juice Bar, located on Fifth Street. The restaurant is owned and operated by Devon Walls, an entrepreneur who was born and raised in Chester. Walls is perfect example of the talent within the Chester community. In addition to being a local entrepreneur, Walls is also a painter, sculptor, photographer, videographer, designer, and furniture maker. Following breakfast, the tour group was escorted to “Art on the Avenue of the States,” a local art gallery operated by Linda Braceland and partners. Next, the tour visited the Abstract Reality Art Gallery, owned and operated by the group’s tour guide, Kenneth “Picasso” Hunt and his business partner Damon Parson. The tour continued along the Avenue of the States, visiting both MJ Freed Theater and the Delaware County Historical Museum along with several other galleries and clothing stores. This article was written by Tejya Johnson. Chester, Pennsylvania, despite its thriving underlying culture, has an extreme problem with both high school drop-out rates and illiteracy. This poses a huge roadblock in redeveloping the local economy into what it once was – Without a high school diploma, there are very low opportunities for employment and financial success. One of our goals at the Chester Education Foundation (CEF) is to combat some of these issues early on by keeping students motivated to stay in school, which will enable them secure jobs in the future and bolster the local economy. CEF’s credit recovery program allows students who have received a failing grade in a class to retake the class and improve their grade point average (GPA). This helps mitigate the issue of student retention, because it offers students an opportunity to both regain credits and boost confidence with a passing grade in a class. This program takes place over the summer months and is facilitated by CEF through the Chester-Upland School District’s summer school program, allowing students to retake courses they failed during the regular school year. The credit recovery program is a phenomenal dropout-prevention strategy, because it removes much of the stigma of having to graduate later than one’s peers due to a failed class. With credit recovery, students are given a second chance at classes while still being able to graduate with their fellow classmates, rather than simply failing a class and dropping out due to diminished confidence from a poor grade. During this year’s program, held from July to August, 130 total students attended at least one day. By the end of the program, 77 students accumulated a total of 94 credits. 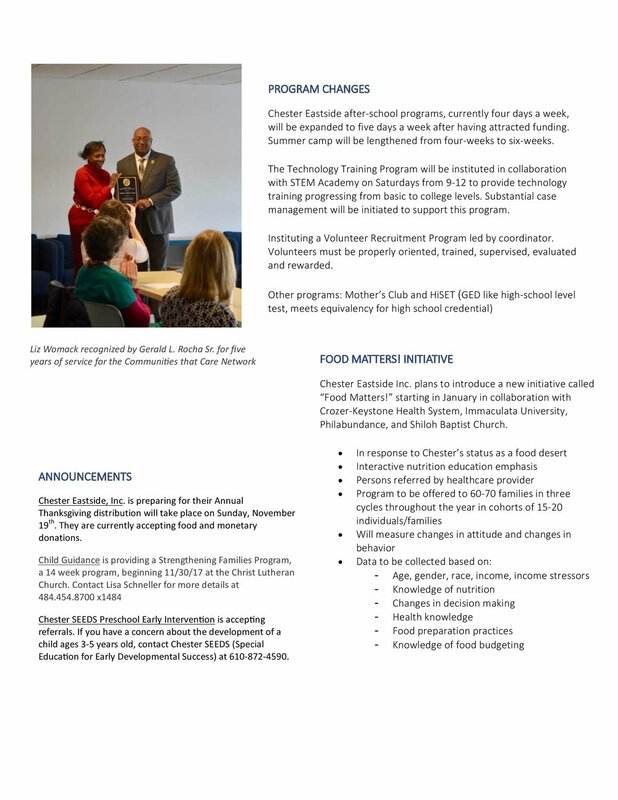 The credit recovery program is a prime example of the need for after school services in Chester, and how the implementation of these programs results in direct success for our community’s students. Chester is an area full of bright and innovative people, and the Chester Education Foundation is constantly pushing to make the talents of the citizens of Chester known. 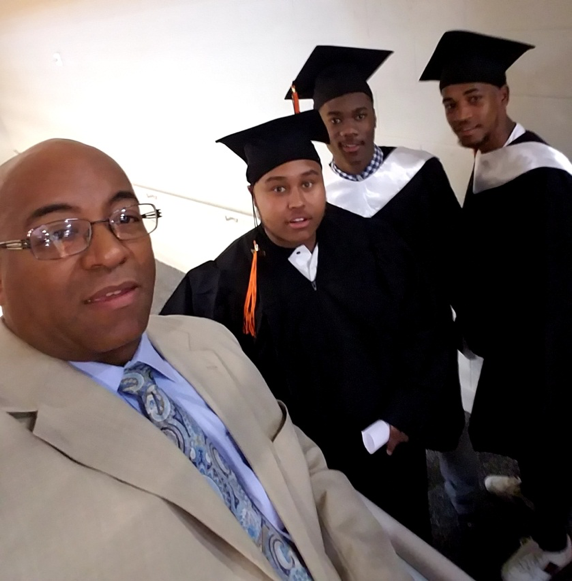 "Pictured is CEF Program Director Gerald Rocha with three graduates from STEM High School. The student in the center, Khalir Barrett, was one of the beneficiaries of the credit recovery program." This post was written by Tejya Johnson. Communities that Care Network members convened on August 10th for a presentation on The Family System Theory by Jamar Daniels and Bill Clinton of the Empowerment Resurrection Center, specifically in relation to the risk factors identified by the Risk Assessment Committee of Delaware County CTC Network. The five priority risk factors were identified to be Low Neighborhood Attachment, Family History of Antisocial Behavior, Interaction with Antisocial Peers, and Depressive Symptoms, and Perceived Risk of Drug Use. Analysis was done using data collected from this year’s PAYS (Pennsylvania Youth Survey), which contained questions in the categories of school, family, individual/peer, community; a full presentation is to be given at next month’s meeting. The Empowerment Resurrection Center of Chester, PA is a drug and alcohol outpatient facility that provides mental health services, group therapy, educational services, and family sessions. The center uses Murray Bowen’s theory of family dynamics to help patients develop an understanding of complex family patterns, ultimately giving them voice to disrupt negative patterns identified by Bowen in his eight key concepts. In Daniel’s presentation of Bowen’s theory, he explains that the family unit is the first system in which one is involved and thus defines many characteristics of our lives and our relationships. These interrelated dynamics are often multi-generational processes, passed down between parent and child, necessitating the family diagram called the “genogram” that maps the eight behaviors including triangulation, emotional cutoff, sibling position, etc., through a series of symbols. Daniels notes the development of self-awareness and the recognition of alternative pathways of action as the key goals of their education program, and believes that the theory of Murray Bowen “introduces people to describing complex relationships in a language that is accessible.” According to PAYS data, 53% of children suffer from history of antisocial behavior, making them more likely to engage in at-risk behavior. Daniels claims that an understanding of Bowen’s Family System Theory will allow children to interfere in these systems in a non-reactive way. Learn more about the Empowerment Resurrection Center at www.erc-chester.org/. 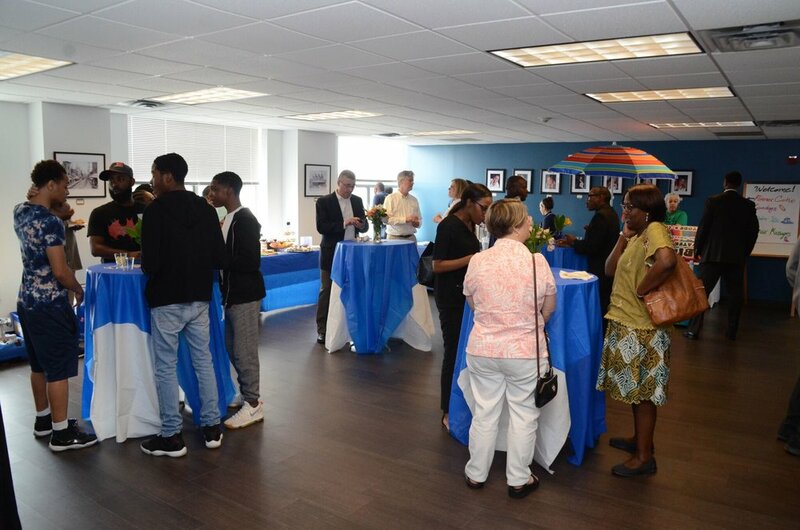 This summer the Chester Education Foundation had the ability to upgrade our facilities, making the move from the former Community Hospital to “The Crozer Building,” located at 419 Avenue of the States in downtown Chester, Pennsylvania. 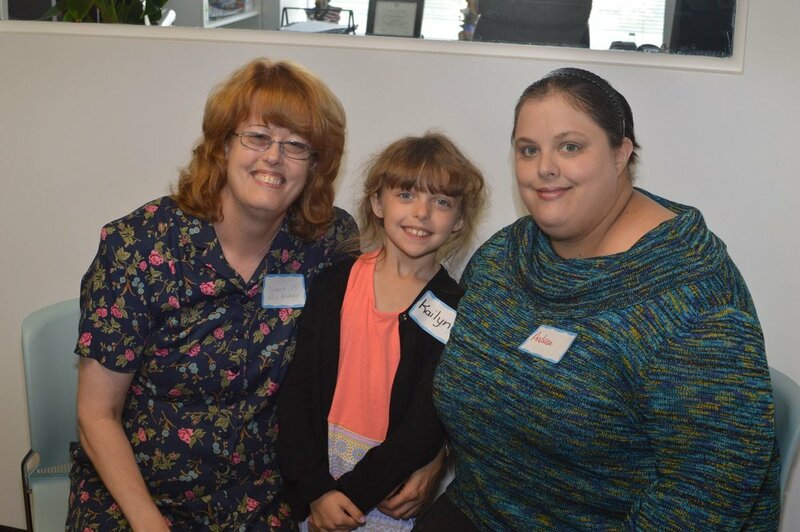 To debut our relocation into the beautiful facilities which overlook the entirety of the downtown area, the Chester Education Foundation held an open house celebration with over 100 attendees. The event was a great success, featuring student demonstrations, scores of delicious foods, and music provided by CEF’s very own Program Director Gerald Rocha. The Chester community showed their support for CEF with discounted food for the event from local businesses pouring in: Local vendors such as Italian Brother’s, Big Var’s Water Ice (a CEF alum and businessman) and Kyj’s Bakery, as well as Reading Terminal Market and Fox and Son Fancy Corn Dogs. 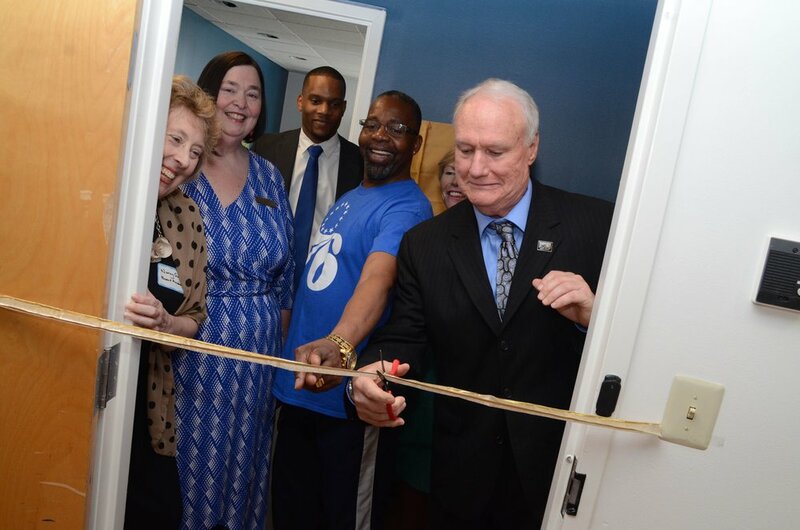 Chester mayor Thaddeus Kirkland teamed up with CEF board members to cut the ribbon and welcome CEF into our new home, as well as present CEF’s new conference room. 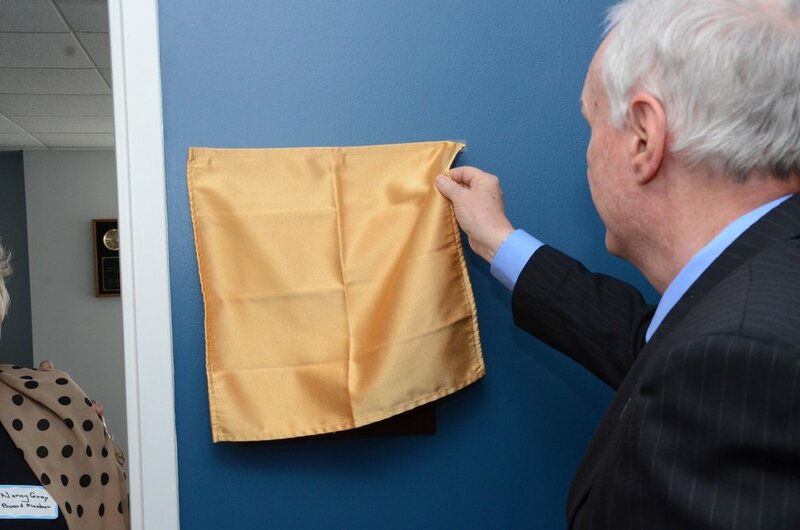 The room features a plaque dedicated to the late Charles Gray, who was essential in developing the foundation into what it is today. The new site features an Alumni Wall of Honor featuring 7 distinguished CEF alumni who graduated between 1991 and 2016. This wall depicts students who have gone to college, including a Gates scholar, a pharmaceutical doctor, an IT administrator, social worker, research fellow, nutritional educator, and a licensed phlebotomist with a certificate in electrical engineering. This wall highlights the true mission of the Chester Education Foundation: to better the Chester community through educating the students in the area and giving them opportunities for growth and upward mobility. CEF plans to keep updating the wall, adding one or two alumni each year. The alumni featured were also honored in a video commemorating CEF’s nearly 30 years of service to the Chester community. “We are excited about this new location that enables us to enhance the programs and services that we provide for the children and families of Chester,” remarked Executive Director of CEF, Cheryl Cunningham.